FILE - Bryan Pagliano, a former State Department employee who helped set up and maintain a private email server used by Hillary Rodham Clinton, departs Capitol Hill, Sept. 10, 2015. The aide, Bryan Pagliano, worked on Clinton's unsuccessful 2008 run for the Democratic presidential nomination and later set up the email server in her New York home she used while she headed the State Department from 2009 to 2013. For months, the Federal Bureau of Investigation has been conducting a review of the more than 30,000 work-related emails she received or sent during those four years. The State Department has found that 22 of them contained "top secret" information, 65 "secret" information and another 2,028 "classified" material. 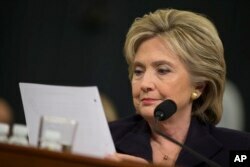 FILE - Democratic presidential candidate, former Secretary of State Hillary Rodham Clinton looks at an email sent by Ambassador Chris Stevens during her testimony before the House Benghazi Committee, Oct. 22, 2015, on Capitol Hill in Washington. Clinton has said that none of the emails were marked with any national security classification at the time she received or sent the information. She said she used the home-based server as a matter of convenience, but now says it was an error. Pagliano refused to testify before a congressional panel last September about the Clinton email server, invoking his constitutional right against self-incrimination. But U.S. authorities now say he is cooperating with the probe, which is ongoing even as Clinton is surging in the race for the 2016 Democratic presidential nomination leading up to the November national election to pick the successor to President Barack Obama, who leaves office in January 2017. The Clinton campaign said it is pleased Pagliano is cooperating with investigators looking to see whether there was any criminal wrongdoing in the handling of the emails that ran through Clinton's server. Clinton's rival for the Democratic nomination, Vermont Senator Bernie Sanders, has largely dismissed concerns about the security of the material in the emails. But Republican presidential candidates have launched regular attacks against Clinton on the issue, saying that she is unfit to be president because she breached national security with the use of the private email server.